The ‘Immediate Drop on Demand Technology’ is implemented in the I-DOT dispensing plates. The plates consist of an SBS-compatible polystyrol frame. The frame accommodates up to 96 dispensing wells. I-DOT dispensing plates are compatible with a variety of liquids. 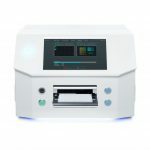 The range includes aqueous solutions containing salts and other ingredients, reagents used for qPCR assays, DMSO up to 100%, Matrigel and many other liquids commonly used in labs. Additionally the I-DOT dispensing plates can also handle solvents like methanol and acetonitrile. Additionally to liquids, dispensing of living cells is one of the strengths of the I-DOT dispensing plates. I-DOT dispensing plates are specifically designed to be used with our I-DOT One acoustic non-contact dispensing systems. 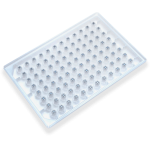 There are two types of dispensing plates available: I-DOT Pure Plates & I-DOT Silica Plates.